Grapevine Studies . . . A T. O. S. Review | My Journeys Through Life . . . Herding Cats In New Mexico! 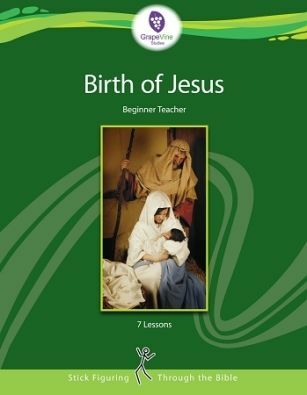 I was quite surprised at how much I ended up enjoying the Birth of Jesus: Beginner (ages 5-7) and Traceable for Beginner (ages 3-6 that I received in digital form from Grapevine Studies to use for this review. I also was given the digital format of the teacher book, which I like. It allows that I may go through it as we go, without printing it out. I can follow it on my lapbook, and my husband tells me I can put it onto my tablet, as well. In the teacher edition, there is a completed copy of each student page, along with directions for teaching that particular lesson. This study CAN be completed in as few as five weeks, but you really can also take more time with it, if you either wish to, or need to do so. 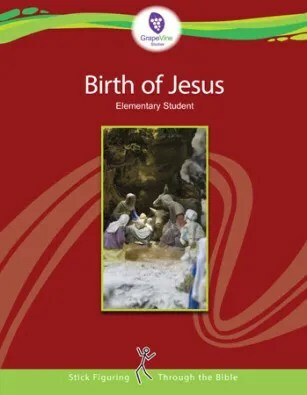 As we go along in these lessons, we are filling out a timeline, memorizing key Bible verses (which we look up in our own Bibles), and learning about the Biblical history of our Lord and Savior. One thing I felt very blessed by, which was totally because of a mistake on my part when filling out what I would like to review; is that I also received the Traceable for Beginner version. It is actually for the very young child, but I do have one son with extremely shaky fine motor control. Because I received the traceables, he didn’t have to draw the stick figures, he was able to simply trace over the very light lines on the page. There doesn’t need to be much reading for the students. 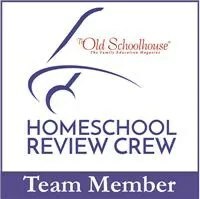 In fact this was a plus for us, since I have at least one child who really, really balks when it comes to reading. I can read the lesson while the kids draw whatever is being covered, in the correct space to draw it. Depending on the age or ability of the child involved, we are using the traceable version for my shaky hand boy (although he is also doing some of the memorization at higher levels), working with the timeline and drawing the figures in the called for colors, looking at Old and New Testament overviews, Learning basic Bible geography (using the map provided), and learning to use basic Bible study tools. One of those tools is a good Bible dictionary, which we don’t have. However, it was very easy to search a free one out online. I really, really enjoy this resource! I think it might be fun to go through it every year during the five weeks leading up to Christmas. 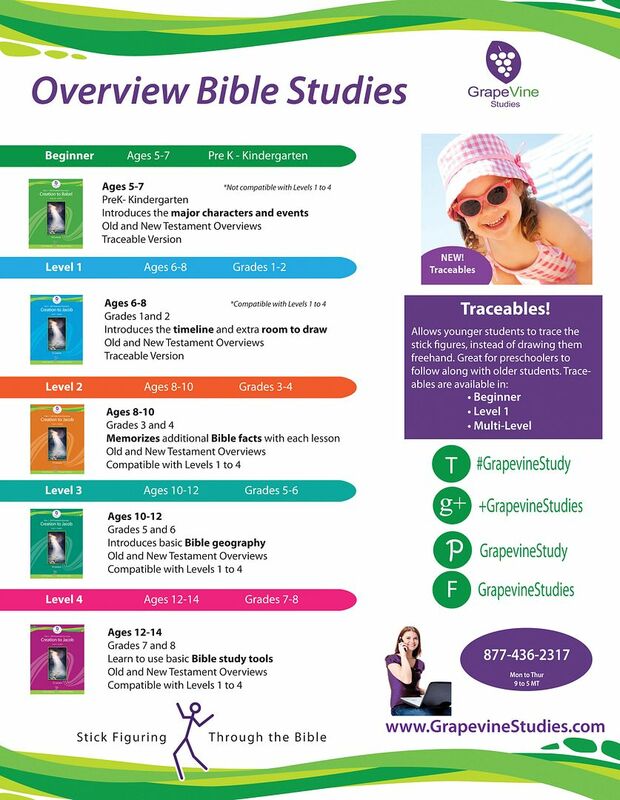 This is our first experience with Grapevine Studies, and it works well for the wide variety of abilities in our four boys. I think we would really like to use this method for other Bible studies!